Question: How to create a folder if it doesn't already exist in Wordpress? In mkdir have following 3 parameters. Folder Permission: Permission of folder. Recursive: true for all sub directory, false for current directory only. Question: What is difference between mode value 0777 and 777 in mkdir/chmod function? In PHP, 0777 and 777 have same meaning and no difference. When you are providing 4 digit in for permission, it means 1 digit will be used for sticky bit. sticky bit is access right flag that can be assigned to files and directories on Unix-like systems. Question: Where to place to insert the google analytics Code? You should add "Google analytics code" in Every page, so that you can get all pages tracking report. As per google, you should add "Google Analytics code" just before the closing of "head" for better results. Question: How to get the current page name in WordPress? You can get the page name from below of two? Question: How do I ge the version of wordpress? Above is get from below file. Question: How to turn off the Notice/Warning from my wordpress website? Open the wp-config.php file and WP_DEBUG set the false. 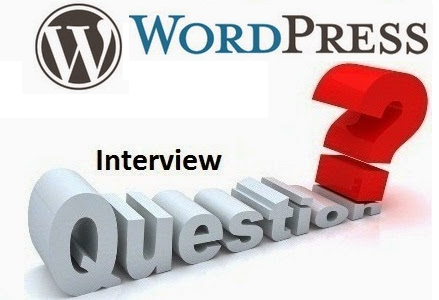 Question: What is use of __() and _e() functions in wordpress? These are function used when you website multilingual. each of this function have two parameter. 1st parameter: String which you want to convert from one language to another. Question: How to get wordpress post featured image URL? Question: How to get last inserted row id from wordpress database? Question: How to Remove P and Br tags in WordPress posts? Open functions.php in your current active theme. Question: How do I get current taxonomy "term id" on wordpress? Question: How do I add Syntax Highlighting on wordpress.com? As you can't install plugin for syntax high lighting in wordpress.com, you can use existing syntax highligher. Question: How to check admin login or Not? How to protect your website from DDos Attack? Add following code in your .htaccess file. How can delete a user without deleting the post and comments in wordpress?